Your explored Twitter in Thing 3: Twitter & Other Online Communities and you’ve been active on our online discussion groups for Cool Tools (you have, haven’t you?). These are both great ways to find answers to questions, share resources and share expertise. We hope these are now part of your PLN or Personal Learning Network. In this lesson consider what your PLN currently looks like, assess what might be missing and find resources to fill those gaps. WHAT ELSE IS PART OF YOUR PLN? Blogs, Websites: What education related blogs, news sources, websites do you follow regularly? These can be a huge piece of your learning network. Local Colleagues: No doubt you have at least a few colleagues that you know you can turn to for help with developing new ideas and solving problems. For many of us, these people are often the core of our PLN. Social Networks: But just because you have a rich network of local colleagues, don’t rule out online social networks as a another source of valuable connections. Social networks can help us connect with other educators in our local communities and around the world. This can provide an amazingly rich source of innovative ideas and support. Stumped with a problem that you can’t solve or need to brainstorm with someone? Maybe someone in your online community has faced this same problem and can share some good ideas. And you can do the same for them. We all have expertise, let’s share it! Professional Organizations: Are you a member of local, regional and national professional organizations? What learning and networking opportunities do they offer? Conferences & Edcamps: Attending conferences and edcamps do double-duty. You learn alot from the speakers and sessions. And even better, you can connect with and learn from other participants. Are you like me and a bit shy at conferences? Make connections ahead of time via social media. I’m amazed at the number of online friends who have become “in-person” friends & valued colleagues as a result of connecting online and then meeting at conferences. Other pieces of the puzzle: Local and state organizations, professional conferences, edcamps, webinars, tutorial websites, and more. 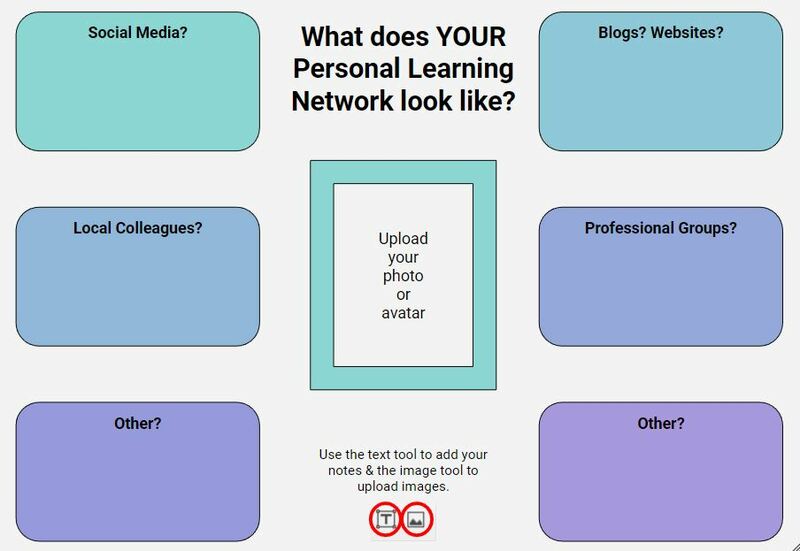 You can use this PLN organizer to help you think about the pieces of your PLN. When you click on that link, it will ask you if you want to make a copy in your own Google Drive. From there you can edit your own copy of the document. Or download this PDF version. Building your PLN – Some great step-by-step guides to developing your PLN through a variety of tools. Making a Name : Office Hours – Growing a PLN can help you building your own professional identity and brand. This article by Michael Stephens discusses ways to help you with this facet of your career building. EdWeb for great webinars – Emerging Tech is led by librarian Michelle Luhtahla, Tech Tools for the Classroom is also great. 16 Education Podcasts to Check Out In 2017 – Nice list from Edsurge. My favorite on this list is Spark from CBC. Cool Tools for School PD Group on Facebook – Join your colleagues from around the country in our very own Facebook discussion group. Identify learning communities you to participate in for continued learning. Identify other resources that are essential to your professional growth. Do you want to be more active in a particular community, but not sure how to get started? How will you get involved? Are there topic areas that you need to keep up with but don’t know where to start? Identify some resources to help you get started. Are you wondering how others keep up with technology, library news, etc.? Join the club! 🙂 Ask members of your PLN how they keep up. Problem-Solving – Your PLN in Action: Share an example of how you solved a problem or learned more about an issue by tapping into the resources of your network. Connections: What people or groups of people and organizations are you most connected with. (no need to name individuals if you don’t want to.) How did you connect with them? Local connnections? Professional organizations? Mentors? Twitter? What value do these people your professional practice? How do you give back? Blogs or other websites that you refer to frequently for ideas? How do your organize your resources so you can access them easily? A symbaloo page? A Feedly account? Web page? Some other online organizational tool? Do you have a schedule for checking these resources. Do you regularly checkin with your local and online colleagues?